Rain fails to catch them on the Hop! TORRENTIAL rain was not enough to dampen the spirit of 60s music at a reunion event. A cavalcade of scooters and Minis braved the weather to drive through WGC and mark the start of the Hop reunion event at Woodhall Community Centre. The Hop was a music venue in the decade which saw the likes of Eric Clapton, Mick Taylor who played in the Rolling Stones and Cliff Richard all play there. The afternoon at the Mill Green Road venue began with a show of fashion from the area by students at Oaklands College. Teenage band Road Runner then performed. In the evening bands from the 60s played, including Hi-Numbers, BlueNotes, Roger LaVern, Herbal Remedy, Recall and Trekkas. Refreshments and a bar were provided by Paul and Sue Lewis, from The Peartree pub just down the road from the Hop. Dave Barber, an organiser of the event, said: "We had a wonderful afternoon and a fantastic evening. "For all who attended or contributed, thank you so much." He added: "We hope that you enjoyed the shows as much as we did." Also, around £1,000 was raised. Everyone was so pleased with how things went, organisers are now promising to make it an annual event. There’s rock around The Hop again! MUSICIANS from the 60s got together for a jamming session in preparation for a reunion next month. Members of BlueNotes and Trekkas were among those who gathered outside Woodhall Community Centre in WGC for a spot of impromptu practice ahead of them playing at The Hop celebration. The Hop was a popular 60s live music venue at the Mill Green Road building which saw the likes of Eric Clapton and David Bowie perform. Drummers, guitarists and bass players stood on the steps to the building and later sang a few Beatles songs. Dave Barber, one of the event organisers, said: "It was great to get the musicians together and go back to where we were in the 60s. "It was really an impromptu jamming session to promote the reunion in June, but we stopped traffic outside." He added: "It was a bit like the old days with people sounding their horns and asking what we were doing." 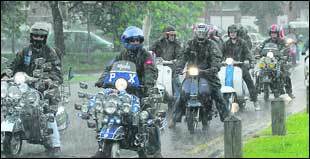 The reunion is on June 16 and kicks off at 2.30pm with a cavalcade of scooters and Minis passing through WGC. They will arrive at the community centre at 3pm. 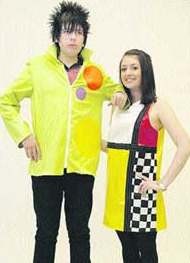 The afternoon will include a 60s fashion parade, music and videos of the time and a live teenage band, Road Runner. Tickets are available from Jaki Augustus at the centre, at varying prices depending on what parts of the day you attend. Call her on 01707 323305. Also call her if you have any 60s clothing for the fashion show. Hop info on local radio station Hertbeat FM web site. Hertbeat gave live on air updates throughout Saturday afternoon. The day kicks off at 2.30pm with the cavalcade of scooters and minis passing through Welwyn Garden City town centre. Their 3pm arrival at The Community Centre will announce the opening of the Hop Reunion Day. The afternoon’s entertainment will be a 60s fashion parade with local students modelling their own 60s designs, music and videos of the era, plus a live teenage band, “Roadrunner” who not only perform 60s music, but also a lot of their own compositions. MINISKIRTS, pinafores and paper dresses - these 60s designs have been re-invented by fashion students in preparation for a revival of a music event in WGC. It started when Martyn Day, an organiser for The Hop reunion, approached their tutor for help. Now the 14 teenagers from Oaklands College will run a fashion show at the event at Woodhall Community Centre. Course coordinator Jo Stephen said: "Some of them have never worked on something right from concept to completion. "But they are a lively bunch and they have done really well, having lots of fun along the way." Student Rudi Vanderbeek, 17, said: "It's been fun going back to the '60s. We've had a chance to try some of the fashion styles out." Sophie Lewis, 19, said: "My favourite part was doing my own design and working through the process of putting it together. "I went for a gold and black dress because a lot of people were going for colour so it was a bit different." Chloe Forrester, 17, designed an orange and gold dress. She said: "I decided to go for a bright colour with flowers on the belt so it had the flower power theme. Jack Grundy, 16, said: "I quite like the retro look so I have found this inspiring." 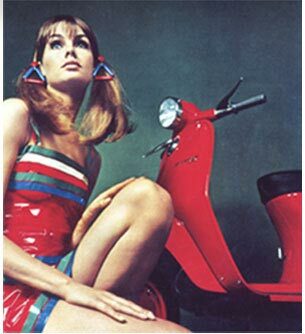 The event, on June 16, will also feature a scooter convoy, footage from the 60s of The Hop and live bands who were going at the time. 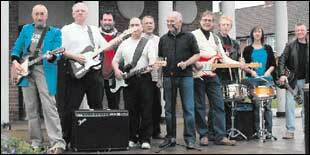 Bands will include The Trekkas, Herbal Remedy, Recall and The Blue Notes. In its heyday the likes of David Bowie and Eric Clapton played at The Hop. Martyn Day, from The Trekkas, said: "This area used to be a very important area for music in the 1950s and 1960s. "People like Cliff Richard, Chas and Dave, the Zombies and Mick Taylor, who played in the Rolling Stones, came out of Hertfordshire. "It will be great to see this revival, although there are no plans to make it a regular event." He added: "It is great to have the students on board. "We would like to add a touch of authenticity and have some real fashions from the 60s as well." He would like people to get in touch with him if they have any '60s fashions, or are a stylist or hairdresser who can recreate a '60s look.